While little physical progress was made on my Wrong Way Farm Stay project due to severe lateral drift (and insufficient funds), it was still a busy year. Progress takes many forms. Things (in my mind, anyway) were happening so quickly I’d get too absorbed in the most recent direction I was drifting to write anything about where I’d just been. So, I’ve decided to summarize some of what went on last year. SRI fits in perfectly with my Wrong Way approach. Tell an Asian rice farmer, preferably a Thai rice farmer, because they seem to be the ones with the greatest “know-it-all” attitude, that they should transplant only one “itty-bitty” (use baby talk when possible) young rice seedling on a 30cm or so grid instead of a clump of 3 to 5 “gweat big” seedlings every 10 to 15cm apart. Assure him that that’s right, about 11 plants per square meter instead of about 100 or more. Then tell him not to flood the rice fields, just use irrigation to intermittently moisten them. Finish off by telling him that rice is not an aquatic plant, that he and his people have had it all wrong for centuries, and that his mother wears army boots. He’ll ask you what brand of Thai whiskey you’re drinking because he’ll be sure to want some, too. Every proposal is downright counterintuitive, but when managed properly, tremendously higher yields, in the range of 50 to even 100%, are achieved. So, what’s a guy who knows virtually nothing about rice cultivation, who’s working on a farming project on the Bolaven Plateau where they can’t even grow rice (the soil is supposedly too porous), doing getting all involved in this for? You would think that the book I’m translating on the subject is the reason for my interest, but I didn’t find the book, it found me. 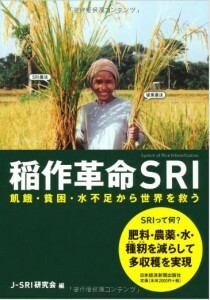 One need go no further than the Cornell International Institute for Food, Agriculture and Development website about SRI. I’m not going to go into the details. This is supposed to be a summary, so if you’re interested, there’s plenty of information on the internet, and I’ll surely write at greater length at a later time. 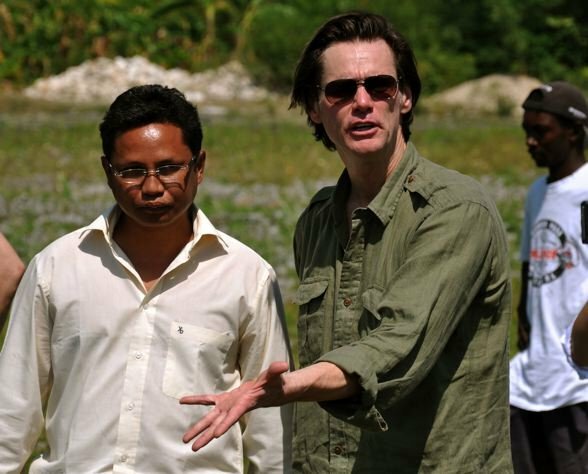 The clincher for me was learning that actor/comedian Jim Carrey has a foundation supporting SRI and its dissemination. It’s called the Better U Foundation. I studied the subject in depth for at least a week before making my move. I like scientific papers and it’s even better when the subject is controversial. Controversial, you ask? How can there be anything controversial about growing rice? The controversy lies in the fact that SRI is a methodology that makes it possible to dramatically increase rice yield without genetic modification to the plant and with greatly reduced inputs such as chemical fertilizers and other agrochemicals. As such, it’s great for the millions of poor farmers practicing it in over 45 countries, but bad for rice researchers involved in GM or the agrochemical business. They are quick to call it an agronomic UFO (Unverified Field Observation). That’s right, millions of farmers are imagining higher yields. Most of this criticism was voiced nearly 10 years ago, but now that there are more than 250 articles about it published in scientific journals, most of the criticism has waned. Thus convinced, I made my move. Nothing I’d read confirmed that I could grow Japanese rice on the Bolaven Plateau. Everything was about switching from conventional rice cultivation to SRI methodology on existing rice fields or in existing rice growing areas. So, I joined the Japan Association of the System of Rice Intensification (J-SRI) because, well, membership was free. My strategy to get answers was one of “Shock and Awe.” I may have exaggerated a little when I wrote to them, but they seemed suitably impressed, if not shocked, to have an American write to them in Japanese about growing rice on unflooded fields on a rural plateau in Laos which had been bombed mercilessly by Richard M. Nixon decades ago. Somehow I was able to add that their help may lead to the eradication of poverty in Laos, if not the entire world. Numerous emails were exchanged with Mr. Shuichi Sato (Sato-san), who I still haven’t met but feel as if I know very well, having translated a chapter written by him and read reports and articles of his that were published in scientific journals. This is a guy who was in charge of developing irrigation systems in Indonesia for 18 years, from 1990 through 2008. He works for Nippon Koei, a company which claims to be “Japan’s No. 1 International Consulting Engineers.” It appears that the Japanese government loans money to developing countries (Official Development Assistance, or ODA) for doing helpful things that naturally involve providing a lot of work to the Japanese private sector. I would normally be skeptical of such an arrangement, especially when you consider the condition of some of the roads that were constructed in Laos with “Yen Loans,” but his story of what went on in Indonesia was quite moving. The whole idea of the irrigation project was to reduce poverty and increase food production in the areas under his supervision. It’s a long story, but when they realized that the government didn’t have the means to provide “soft” support to the farmers, it became clear that they had to do something if they were to achieve the goal of the project which was to “really, really help” people. And so it was that after getting the government’s permission they were allowed to do a “sub-project” which included the dissemination of SRI methodology. This meant working closely with farmers and such which is not usually part what they do. I mean, they survey land, oversee the digging of canals, damming up of streams, drilling of wells. . . They don’t usually get involved with convincing farmers that something as counterintuitive as SRI can actually improve their lives. The fascinating bit is how it changed the lives of these presumably geeky engineers. As an occasional though mostly unwilling freelance translator, I was delighted to get the work. Though the rate is modest, it’s made up for in sheer bulk. It’s a “for information purposes” translation, not a “for publication in book form” translation, so if I fail to dot an “i” or cross a “t” somewhere, nobody’s going to label me a crappy translator. And its not about the latest trend in women’s shoes or the finances of some obscure securities firm, it’s about something that I’m interested in. Plus I can do a chapter or two whenever I feel like it, and I’m paid immediately after I turn the work in. It’s a translator’s dream come true. And it’s probably changed my life, too, not to mention help me pay some bills. Well done , Richard wish you all the luck with this.